Looking for a cheap place to park in the nation's capital while you explore its museums and monuments? Having a rental car can be handy for seeing the District's key sites or for zipping off to National Harbor, Baltimore and Old Town Alexandria. But like all cities, D.C. has a few tricks that can make parking a lot easier. Before pulling into an expensive garage to explore the streets near the White House, try using one of the thousand meters around Washington, D.C. There are two kinds of meters: classic "single-space" meters and "multi-space" meters that manage parking for several spots on a block. Washington, D.C. has about 17,000 metered spaces overall. Depending on when you are in DC, you might be able to find free parking. The city does not enforce the meters on Sundays or about a dozen major holidays throughout the year. You can also park for free on normal days after the enforcement hours for meters have ended, but note that this may vary depending on neighborhood. Generally, the meters are enforced between 7 pm - 6:30 pm. However, these hours may be extended to 10 pm in the city's "premium demand zones." Also note that there is still some free parking left near the National Mall&dash;including more than 300 spaces on Ohio Drive in East Potomac Park. Newer meters were installed a few years ago in the spots on the Mall itself. Can't find a free spot? Generally, a regular metered spot will cost $2.30 per hour, but the city has a pilot program where the cost changes per time of day in the Chinatown/Penn Quarter area. This zone includes the National Building Museum and National Portrait Gallery. The price variation is pretty big—anywhere from $1 to $6.50 per hour. Spots on the National Mall might be a little bit cheaper; as of April 2018 they were $2 per hour for a three-hour period. You can use credit cards, debit cards or good old-fashioned coins to pay for parking in Washington, D.C. It is also possible to pay with your phone through the Parkmobile app (see below). 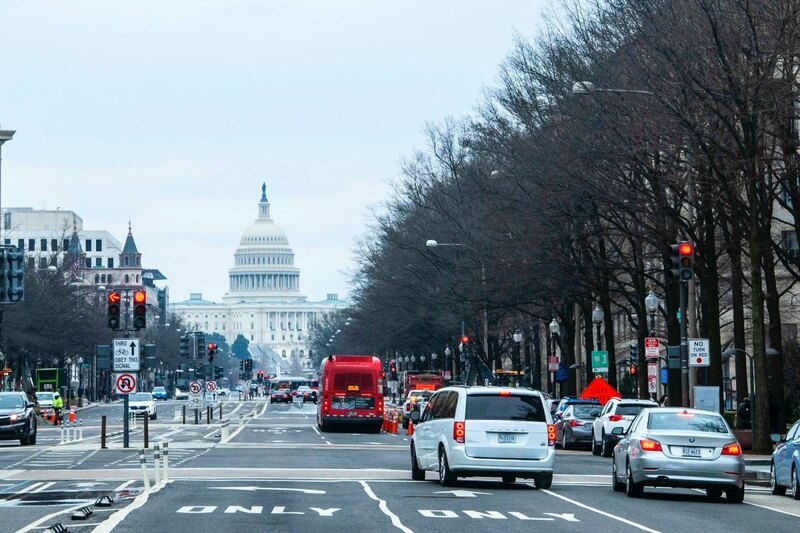 Be aware that many streets in Washington, D.C. without metered parking carry restrictions for all non-residents, and any out-of-state plate is a target for fee collectors. Vehicles without a residential sticker are limited to two-hour parking on these streets. It's also a good idea to look out for any notices about street cleaning. The GoDCGo website offers maps of parking zones and HOV lanes. ParkMobile is the download you need if you want to pay for metered spaces with your phone. SpotHero offers a handy dynamic map of downtown DC and allows users to reserve parking. BestParking also has a dynamic map with the prices and capacity of each parking location.